just above treeline on the Sharkstooth Trail. Down the hill a little ways, an old goldmining operation has been turned into an historical education site. Gold there is, but after great expense the investors discovered there was not enough water nearby to run a commercial operation. The trail skirts the upper basin where the North Fork of the Mancos River rises. 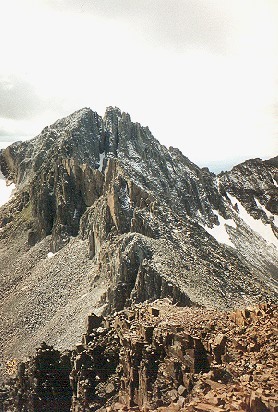 Centennial Peak, (13,062) is the first mound, left of center. Lavender Peak (13,180), a highpoint on Mt. Moss, is the dark mass of grey rock to the right. above 11,500 feet. This shot is taken while standing on the last of the grass. 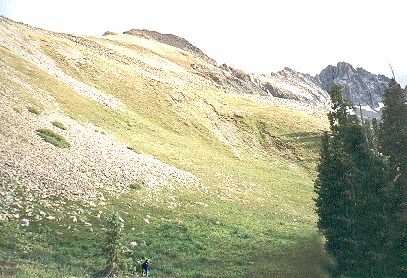 Once the land leveled out on this shoulder, we were able to breathe easier and naturally drawn up the spine of Centennial, which repeats much of the same layering as is found in Hesperus. The earth just seems to fall away from places like this; one gains access to the sky. Ascending Centennial Peak was a relatively simple affair, but from there over to Lavender and then Hesperus was way more than we were prepared to attempt, so we sat down and did what many people who had come to this same conclusion have done; we ate lunch while taking in the view. These are the La Plata Mountains, a subsidiary range on the extreme southwesten edge of the San Juans. The La Platas contain a variety of intrusive rocks squeezed between beds of Pennsylvanian limestone and Permian red strata. They may be some of the clustered roots of volcanic vents which helped blanket the San Juans in igneous rock over the last 40 million years. We finally made it up Hesperus in '96 and the view is superb, but I am not sure it is any better than the one from Centennial. 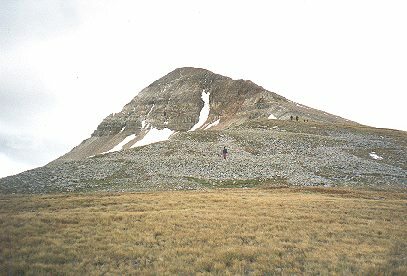 Both mountains offer great vistas of the jagged rocky ridge and pinnacles which rise into nearby Mount Moss and Lavender Peak, but Centennial is an easier hike and besides, it offers an exposure of the layered beds within Hesperus that is truly magnificent. and the bulk of Hesperus, which is out of this frame to the right. When members of THS finally got to the top of Hesperus in the fall of the following year, we crawled up from the other side of this formidable barrier and peeped through the notch visible in the dark band of rock to the far right (there's a little streak of snow trailing out of it) before making the final ascent. Looking east toward Snowstorm Peak, 12,511. Diorite Peak is on the right. 65 million years ago geologic forces arched 10,000 square miles of the earth's crust into a huge dome. Originally flat sea beds were thrust skyward at steep angles. The peaks magnetized clouds and occasionally, glaciers, so that erosion eventually removed the upper layers of sediment exposing the crystalline basement rocks, dating back almost two billion years. In the photo above, we are looking north from Centennial Peak; Lone Cone (on the far left) marks the western margin of the San Juans, just as Hesperus defines the southwestern extreme of the uplift. Elevations to the south and west drop off into the San Juan Basin. The high ground to the right is the Lizard Head Wilderness. Among those snowy peaks are three fourteeners, El Diente, Wilson Peak and Mt. Wilson. Viewing to the northeast, the dark mound to the left is Engineer Mountain (12,968). Scanning right, the land opens into Lime Creek Valley as the distance climbs toward Twin Sisters and Molas Pass. In among the snowy peaks around Silverton, is the Hajiin of the Navajos, a small island in the center of a lake surrounded in the cardinal directions by four high peaks as described in Navajo tradition. According to the Diné, this is where they emerged from the underworld as well as where the spirits of the Navajo dead pass down to the underworld. The West Needles Range is the dark mass near the center of the photo, dominated by Twilight Peak (13,075). The highly contorted Twilight Gneiss was formed 1.78 billion years ago, making it the oldest rock in the San Juan Mountains, morphed long before there was any multicellular life. Moving east, the low area, (greener than the other shots in this mosaic) is the Animas River Valley. Rising high above the river, the two dark sentinels with sharp profiles are Pigeon (13,972) and Turret Peaks (13,835). The Needle Mountains, visible on the far right with a dusting of snow, are crowned by three rugged fourteeners; Windom, Sunlight and Eolus.